Real home decorating style doesn’t blindly follow trends – but reflects the essence of those who inhabit the living spaces. And what we discovered when we visited the home of Dr. Nafees and his wife Rohma and their two children – was a home that truly highlights Mrs. Nafees’s eye for detail and her intuitive flair for colour, texture and spatial arrangement. Originally from Lahore in Pakistan, this family have been living in Brunei for the past 13 years and feel completely at home here. Elegantly dressed in a beautiful gold and navy blue salwar kameez, Rohma explained, “Both our children Umair and Aliza were born and raised in Brunei and we love the peaceful lifestyle here. The Pakistani community was established in Brunei around 1980 and is a very close knit and vibrant one. We now have around 1,500 people here, many of whom are diligently working as doctors, prominent businessmen and teachers.” She said that it is easy for Pakistanis to blend into the Bruneian way of life because both cultures follow the same religion and celebrate Hari Raya. Having enjoyed many Raya celebrations in years gone by, she’s now looking forward to the upcoming celebrations this year and told us that two Pakistani dishes that are favourites with locals during Raya are the mouth-watering Chicken Biriyani and Chicken Karahi. And of course, as Raya approaches many people are thinking about how to best decorate homes. 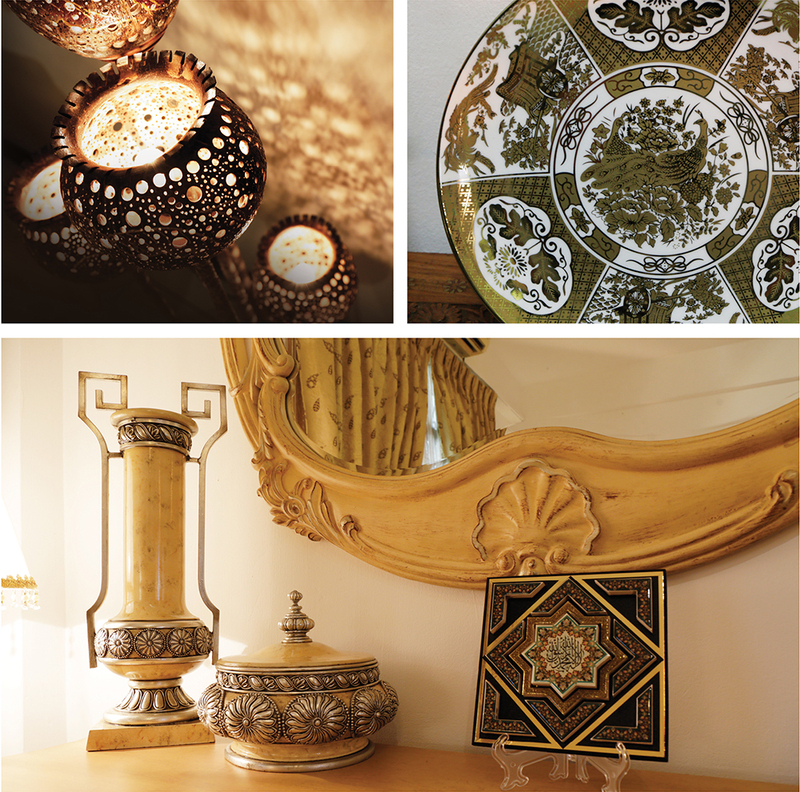 When it comes to décor, Pakistan’s exceptional local craftsmanship is world renowned. Their artisans are undoubtedly skilled when it comes to creating alluring artwork and stunning handicrafts – they have achieved wonders in this field. And they are also masters when it comes to weaving, designing, embroidery, printing and carving. 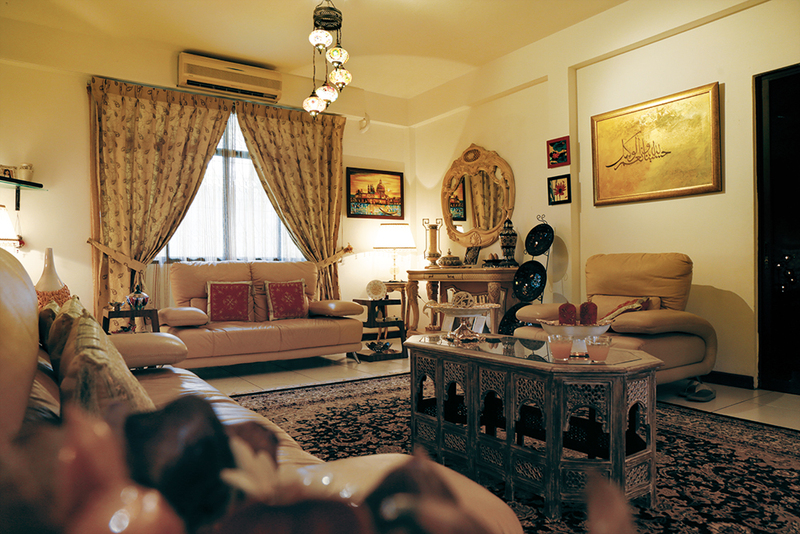 And looking around the Nafees’ living room we saw evidence of this – tastefully chosen pieces of furnishings from Lahore and Kashmir graced their entire living room. Rohma admitted that she’d purposely chosen to furnish her living room with beautifully handcrafted and vintage pieces – since these have a timeless quality. Taking centre stage in this living room is one of Rohma’s favourite pieces, the stunning Mughal styled wooden divan from Kashmir. She explained that she admires furniture made in Kashmir because of the top quality wood used, the fine craftsmanship and the opportunity to customise furniture. For example, she was able to ask for the intricate brass pattern to be included in the design of the divan. Other exquisite accessories that add hints of eastern charm to this room include: the luxurious-looking handmade carpet that enhances the wall; the ornate coffee table; the gold framed mirror, a traditional Pakistani gift from a friend; and smaller delicately crafted ornaments. This article was published in the June 2016 issue of Inspire Living Magazine. Download it here!